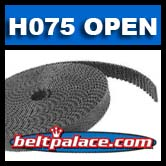 H075-OPEN BANDO Synchro-Link Long Length Timing Belt. Sold as Single Roll: Approx. 137 Feet Length (41.76 meters). Black Rubber (Neoprene) with fiberglass tensile cord. H Section (1/2" Pitch), 3/4" Width (.75"), Approx. 137' Length Roll. *CLEARANCE PRICED WHILE SUPPLIES LAST!